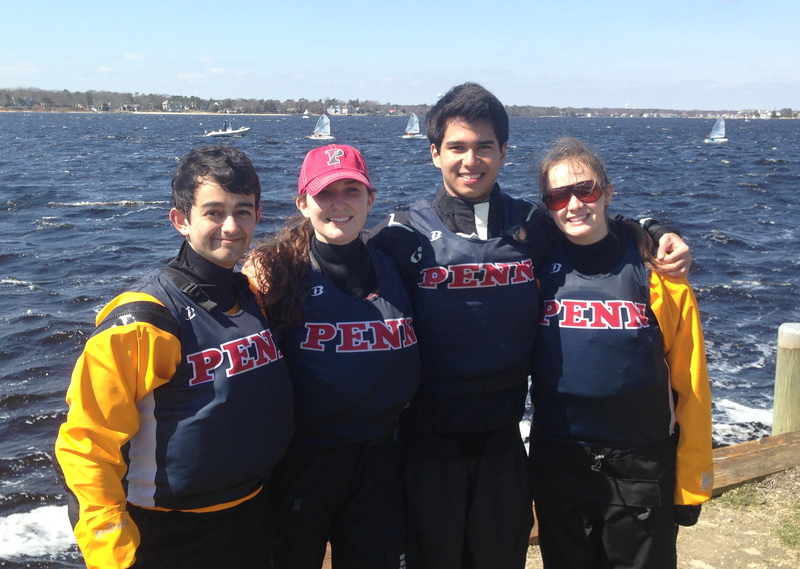 Penn Sailing 5th at America Trophy! 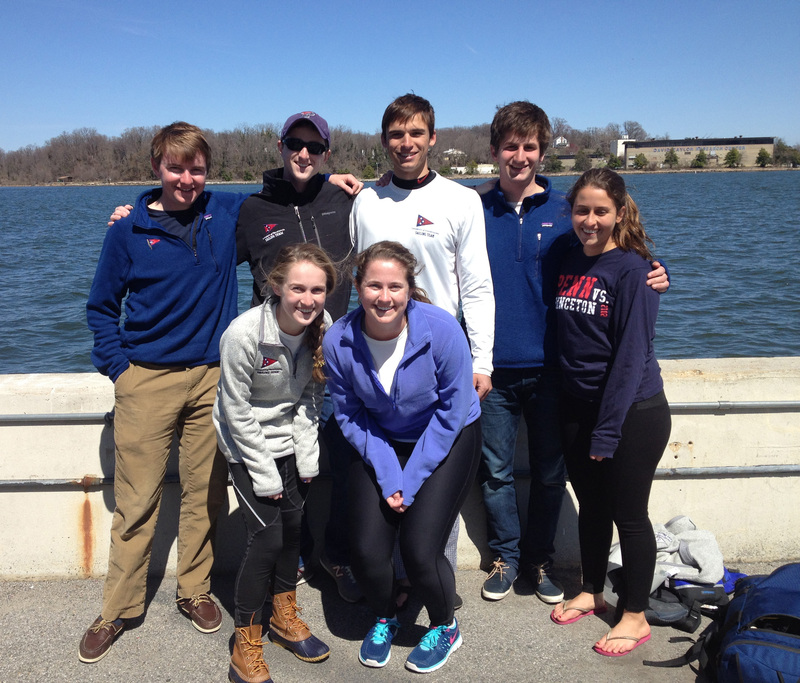 What a weekend for the Penn Sailing Team – what a year, in fact. As I write this, I think back on the past year and how far the team has come in such a short time. Sorely missing our strong senior leadership from last year, it was a hard road for us to travel to get to this point. But we’ve finally made it, everyone; here’s how it happened. This past weekend I traveled with Mac Agnese, Patricia Andrade, Catie Hopkins, Meaghan Harding, and Joe Farned to Kings Point for the second weekend in a row. This time, it wasn’t for a competitive 3-division intersectional, but for our conference championship, which is the qualifier for the first round of the ICSA National Championship. It was no longer time for practice and focusing on improvement, but time for performance. Each and every team was bringing their A-game to perhaps the most competitive America Trophy in the history of MAISA. The top 8 teams would earn a spot to the Co-ed Semifinals; the remaining 10 would end their competitive seasons there. We drove up to New York City on Friday evening and ate at a delicious Long Island diner before heading off to bed for a good night’s rest at the hotel. Saturday dawned rainy and chilly, but the sun was beginning to come out by the time we hit the water around 10:00. Pati and I held down A-Division while Mac and Catie took on B-Division. The first few races for both fleets were light and shifty, which led to some up-and-down races for many teams. Pati and I heeded the words of our coach Johnny Norfleet and tried to minimize mistakes which led to us sailing 4 consistent races in the morning before lunch. Meanwhile, Mac and Catie jumped out of the gate in B-Division with a 2, 5 to start the day. The race committee managed to get two more B-Division races in while A-Division ate lunch on shore, in which Mac and Catie sailed another great set of 7, 2. Then the fleets switched and Pati and I were able to sail two more consistent A-Division races before the wind completely shut off and we waited on the water for the breeze to fill. We experienced a variety of weather conditions including heat, cold, sun, rain, and even a rainbow, but consistent breeze was not among them. Around 5:30 the race committee gave up and sent the fleets in for the day. After six A-Division races and four B-Division races, we were sitting in 6th place, just ten points out of third. Saturday was also Mac’s birthday. His mom, who came all the way from Florida just to see us, generously offered to treat us to dinner on Saturday night – thanks again Mrs. Agnese! Sunday brought much stronger breeze and abundant sunshine, with winds varying from 10 to 18 knots. The race committee decided that there would be lunch on the water so as to minimize downtime and allow B-Division to make up their two race deficit. Both Mac and I came out of the gate strong and moved up to third at one point during the day. The conditions were extremely challenging: the breeze was strong but very shifty, and the waves often came from multiple directions at once due to the strong and unpredictable current for which Kings Point is infamous. This made for thrilling but difficult competition in both divisions. Around race 12, Pati switched in with Mac due to increasing breeze strength while I took Meg to sail the 420. After 10 challenging races in A-Division and a whopping 12 B-Division races on Sunday, the 4:00 time limit expired and the regatta was finished with 16 races in each division. After all was said and done, the team placed an extremely impressive 5th overall, bolstered by Mac’s tremendous performance in B-Division in which he tied for 1st! We couldn’t be happier with our result, not only because we know that we gave it our best and performed well, but also because we punched our ticket to Nationals for the first time in over 5 years! The Quakers are back! At the awards ceremony afterwards, the MAISA All-Conference Awards were presented. Mac was named to the Second Team All-MAISA for Co-ed, and was one of only ten co-ed skippers to be named All-Conference this year. Congrats to Mac! At such a critical point in the season, there are so many people that I want to thank. I won’t do them all here (you’ll have to wait for our newsletter! ), but first I do want to take the opportunity to thank our coach Johnny Norfleet for doing such a great job with the team this season and helping us get to the next level. I also want to thank all of the parents and friends of Penn Sailing who helped us along the way this past year –especially the Swikart Family, the Harding Family, and the Landy Family, who graciously housed the team on multiple occasions this year. And of course, I want to thank all of the members of the Penn Sailing Team. From long rides in the old minivan, to no-breeze practice days on the Delaware, to always making time for team meetings, you all deserve tons of credit for this accomplishment. You’ve made your captain so proud. Make sure to follow the team as we head for Nationals next month! We’ll be periodically posting updates to our Facebook page, as well as updating here during the regatta. The first round of the 2014 ICSA Nationals at St. Mary’s College of Maryland starts on June 3rd. See you all then! 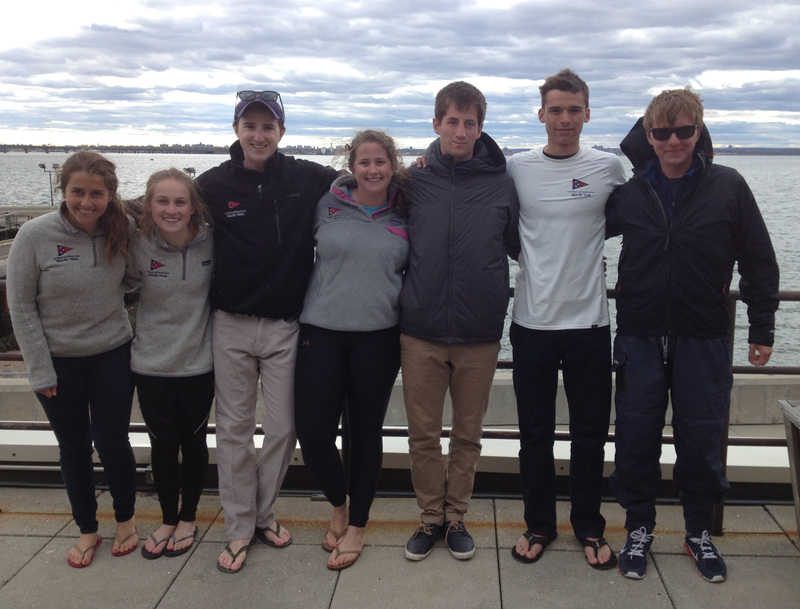 Over this past weekend, April 19-20th, Penn Sailing competed in the Admiral’s Cup intersectional hosted by Kings Point in Great Neck, NY. With teams from MAISA, NEISA, and MCSA in attendance, Penn fought to a 14th place finish out of 20 teams. 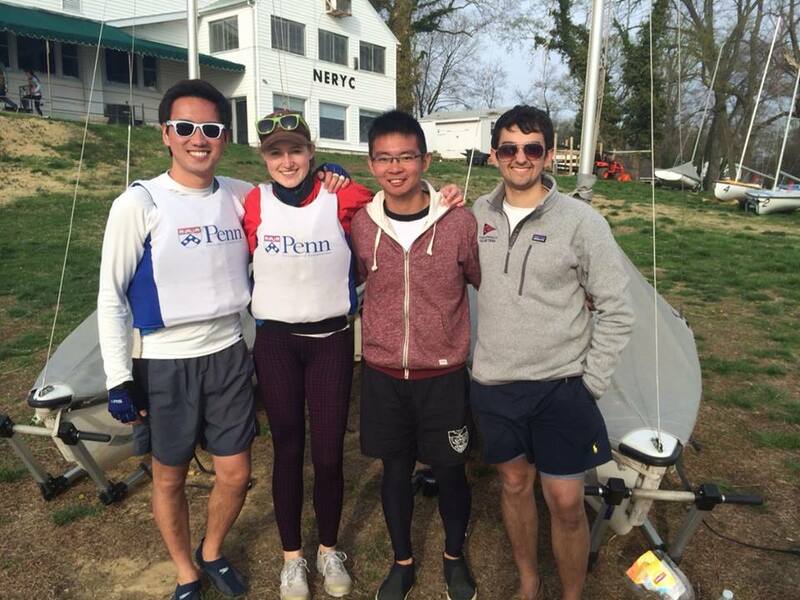 In A Division, Jack Swikart ‘15 and Helen Boone ‘16 represented Penn. 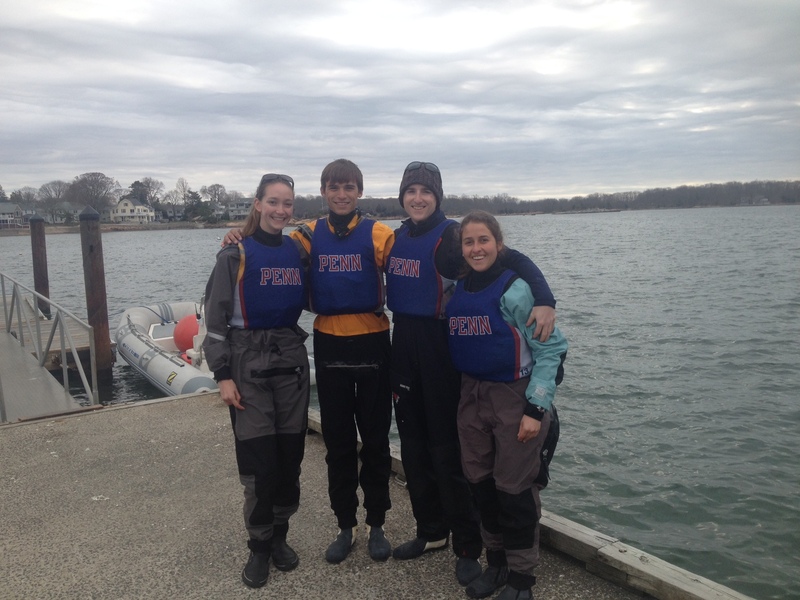 Mac Agnese ‘16 and Catie Hopkins ’17 sailed B division. In C division, Joe Farned ’17 sailed the Laser Full Rig. On Saturday, we saw light winds building to about 15 knots. In all three divisions, the team posted mixed results, with more difficult races interspersed throughout top 5 finishes. Throughout the day, the start proved crucial, as strong current and a short trapezoid course heavily favored the leaders off the line. After a lunch break, the wind died and the race committee ultimately called racing around 5pm. On Sunday, we were greeted by more consistent breeze. With this breeze, we were able to round out a 14 race regatta by 1:30pm. The competition on Sunday proved equally stiff. The line was heavily pin favored; the winner of the race was consistently the boat able to win the pin and tack off the line with clear air. With these challenging conditions, Penn was still able to post some strong finishes and concluded the regatta in 14th place. Next weekend, Penn will be taking the America Trophy in its bid to qualify for Nationals. A huge thank you goes to the Swikart family for housing us and feeding us a wonderful Easter dinner! Also, thank you to our coach Johnny Norfleet who helped us perform our best throughout the weekend. This weekend Meaghan Harding, Caroline Garth, Patricia Andrade Chevres and I headed up to the North Country to compete and MAISA Women’s Championship at Cornell. MAISA Women’s Championship serves as a qualifier for Women’s Nationals. Our weekend of ‘dreams coming true’ did not quite reflect in our scores, but Penn women’s sailing had an incredible weekend in terms of learning and development. Caroline Garth skippered the A division with me as her crew, and the multi-talented Meg Harding skipped B with Pati Andrade Chevres as her crew. On Saturday morning, we arrived at Lake Cayuga and started racing around 9:45AM. The wind, roughly breezing at 12 knots, was solidly coming in from the North West. Although the air was cold and the water was colder, there were no delays in the competition and in total 10A and 10B races were held. On Saturday night the gals ate a lovely dinner in Cortland, New York, then returned to the hotel to rest up and prepare for tomorrow. Easter morning we returned to Lake Cayuga and found an egg hidden underneath our boat (a gift from the easter bunny, perhaps). We sailed two more sets in a light, shifty and unpredictable wind coming from the South. A few races were restarted and the sets were long, but after finishing the day at 4PM the Quaker Ladies were both proud and pleased with the progress they made. In Caroline’s best race she came in 7th and Meg’s best race she also came in 7th. 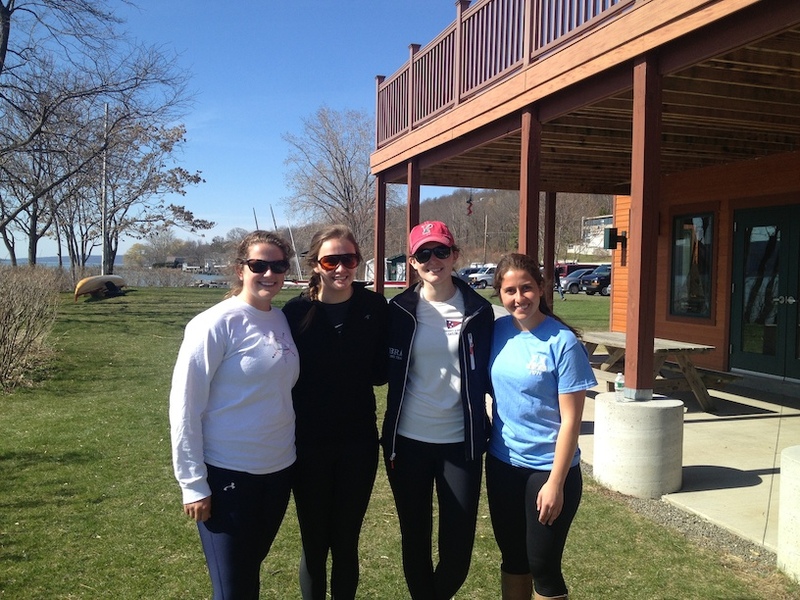 Thank you to the Cornell Sailing team as well as the racing committee for hosting and managing the event. Last weekend four recreational members of the team, Matthias Chia, Cruz Vargas, Steven Ho, & Audrey Harnagel headed down to Newark to compete in the Delaware Spring Open. This was Audrey’s first regatta, Steven’s first regatta as a skipper, and Cruz’s second regatta. The sea-hardened and experienced sensei Matthias had much to teach us. For most of the team, this was our first time in Newark, DE. We decided to explore Main Street to try out some of the local cuisine and ended up eating dinner at both California Tortilla (2.5/5 stars) and a place that specialized in macaroni and cheese dishes (3.25/5 stars). We arrived at the course a few minutes after 9 on Saturday morning with a little bit of rest and quite a bit of eagerness to sail; the weather was perfect. Races started around 10:15, with a solid westerly wind of about 8 knots. Right before lunch the wind shifted to coming out of the northeast, so the course was changed accordingly. The wind almost completely died a few times during the day, though only briefly. For most of the day the wind fluctuated between 5 and 13 knots. Matthias and Cruz sailed hard, and steadily improved throughout the day. When the wind shifted towards the middle of the day, the course was changed from a W4 to a W3. Unfortunately Matthias and Cruz missed this announcement and shot outside of the finish line towards the windward mark when they should have been finishing with second place. Despite the quick turn around and (re)finish, they still managed to not get last that race. Two of the last three races were first place finishes for Matthias and Cruz, and they ended up tying for third place in the A division, even with the midday misunderstanding. Steven and Audrey sailed competitively in their division, and had several finishes above the middle of the pack. They placed fifth in their division (only 1 point away from 4th) but also steadily improved throughout the day. The final race in the Delaware Open resulted in a first victory for both sailors in their respective positions. Special thanks to Matthias for patiently teaching me the ropes throughout the weekend. Also, shout out to Mitch Poster and housemates; you guys were great hosts and probably the chillest people I’ve ever met. Stay S-themed my friends. Our regatta weekend started on Friday afternoon as Jack Swikart, Mac Agnese, Pati Andrade, and I drove away from Penn’s Spring Fling weekend carnival and headed north towards Yale. After a daunting four-hour drive up, we stopped for our traditional Outback dinner before arriving at the hotel. After a team bonding movie night watching Disney’s Frozen, we all went to bed. Sunday was a little cooler than Saturday, with a lighter 5-7 knot breeze that gradually built to 10 knots before lunch. Jack and Pati were now sailing FJs while Mac and I took on the Z420. After four morning races, both fleets returned to shore for a quick lunch break. The sailors returned to the water for three final races in a slightly lighter SE breeze with large waves from the Long Island Sound rolling right-to-left across the course, making for tricky conditions. The team is very pleased with their performance on the weekend, since the Owen Trophy also serves as the Ivy League Championship, in which Penn placed 3rd behind Yale, the number 2 team in the nation, and Brown, which ranks 11th. It was a great improvement on our result from last year, and we look forward to getting even better going forward. Not to mention that we had fun getting back into the swing of fleet racing and thoroughly enjoyed getting to try out the new Z-420s, which will be featured at the ICSA Nationals this June. Thank you very much to Yale Corinthian Yacht Club and the Yale sailing team for hosting the event! 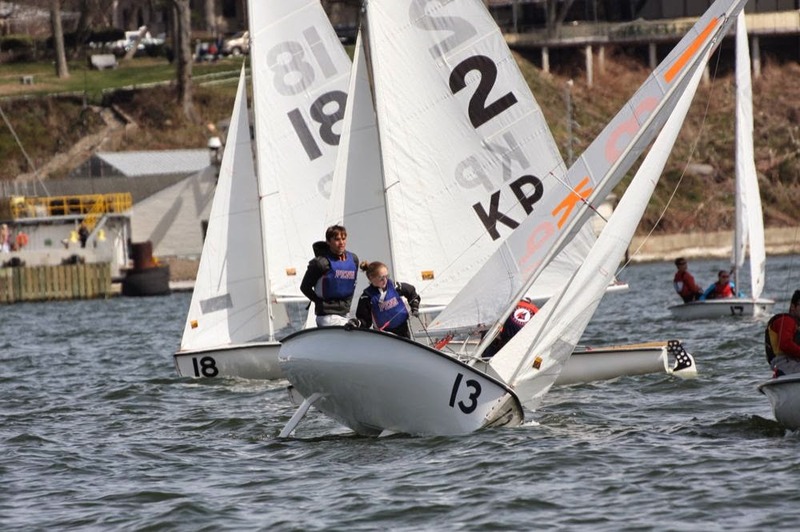 Over the weekend, the Penn sailing team traveled to the Naval Academy in Annapolis to compete in the Prosser Trophy, which also serves as the MAISA Conference Championship as well as our qualifier for team race nationals. We drove down with a full van, consisting of Jack, Joe, Foster, Meaghan, Pati, Catie, and myself and had the pleasure of staying at the Harding’s house. After a relaxing movie night and a good night of sleep, we headed to the venue early Saturday morning to compete in the first team race conference championship that Penn has been to in years. Saturday began with a 15 knot northwesterly that held throughout most of the day allowing us to get 16 races off. We were able to pull off a few wins and more importantly we consistently improved as the day progressed. It was also a beautiful, sunny day in the high 50s, so it proved to be an all-around great day. To top it off, the Harding’s had a delicious dinner waiting for us when we got back! Following another great night of sleep, the team made its usual pit stop at Naval Bagels and arrived at Navy early for what would prove to be a long day, but with a lot less racing than the day before. The light and fluky northwesterly caused some problems for the race officials, as many races were abandoned. Eventually the wind filled in from the east and we were able to complete the third and final round robin of the regatta. Like the day before, we got better and better and will look to come back stronger in next year’s team race conference championship. Big thanks to the Naval Academy, the volunteers, and the umpires for putting on a great event and of course to the Harding family for hosting us once again! This past weekend, Caroline Garth, Max Ryder, Nina Kaledin and I traveled across the state of New Jersey to Toms River for the Ocean County College Spring Open. It was my first regatta so I was really excited to get out on the water on Saturday. After a hearty meal at the Garth household and a good night’s sleep, we were ready to go on Saturday morning. On Saturday the regatta began with winds from the NW at around 17 mph. Caroline skippered A Division with Nina crewing while Max skippered B Division with me in as his crew. During our first B Division set, the winds increased to 24 mph with gusts up to 30 mph, so after only 2 sets, the races were cancelled for the rest of the day because of the high winds and multiple capsizes in both fleets. Max and I were unfortunately in one of the boats that flipped! On Sunday, the conditions were much more tame, with winds out of the West around 7 mph. We were able to get much more racing done than we did on Saturday, with both A and B Divisions getting off 8 races before the wind died in the middle of the day. Though it filled back in just before the deadline, the races were cancelled after a total of 5 sets between the two days. Overall we finished sixth out of the 9 teams, just barely missing out on 5th by one point to Columbia. Both of our boats were able to crack the top 5 in races over the course of the event, and we learned and improved a lot. A special thanks to the Garth family for hosting the team at their home this weekend, as well as helping us arrange our transportation to and from the venue! I’m very excited to go to more regattas in the future.